consuming project yet: The largest plane to ever fly to date, the Antonov An-225, built very close to a 1:1 scale! The plane is foolproof up until about 110 m/s. Above that, very hard pitch maneuvers (especially upwards) will result in the planes disintegration at higher speeds. You have been warned. Use quicksave [f5]/quickload [f9] during flight at your own risk, the aircraft will likely explode on physics load. To taxi the plane on the runway, activate one outer engine on each side and pin their UI windows to the screen. Set one side to reverse thrust to turn in that direction. Play with brakes and throttle along the way for fine control. If you want to add more fuel, fill the Mk3 Tank on the back of the plane, marked by a small grey circle. More fuel requires more speed to take off, but can add several hours of flight range. Note that the higher you fly, the less fuel your engines require to run at full speed. To exit the aircraft with your crew, activate the hatch ladder  click on the cockpit, click Transfer Crew and transfer your crew to the crew capsule in the planes belly just behind the front wheels. Left click the door of the crew capsule and select the Kerbal you want to EVA with. If you want to carry another object/plane/SSTO, make it a subassembly and attach it between the fins on top of the plane, next to the wings. Dont forget to add some struts. Check your center of mass (COM) and use the move tool to adjust it. If you want to walk your Kerbal on top of the plane, EVA through the cockpit and walk up the side. The plane explodes on quickload during flight [f9]. A known issue for large structures being loaded in to physics and aero forces. The landing gear cannot be steered. 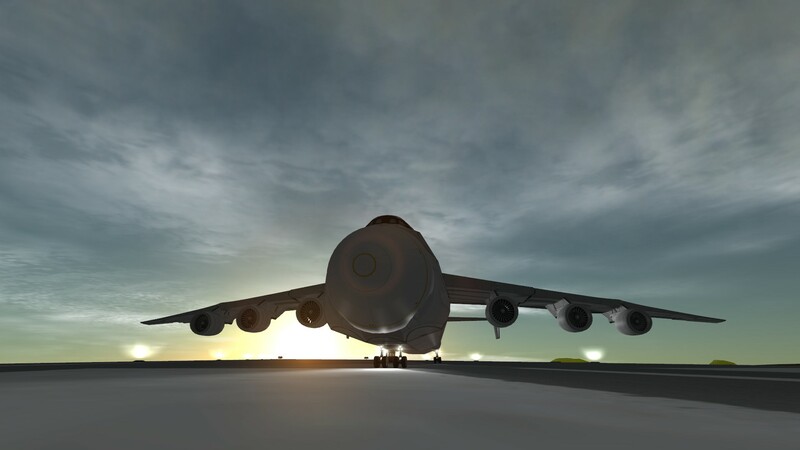 As of KSP 1.3.1 (stock), there is no steerable landing gear large enough for this plane, so we have to use thrust and control surfaces to steer the plane. The plane randomly disintegrates during flight at higher speeds and strong pitch maneuvers. The Frankenstein-like nature of this plane and the endless amount of struts make it hard to tweak the structural weak points. While I’m trying to find a balance between stiffness and part count, I’ll update the plane if I can improve the durability in the future.